De Martini/Arnott has provided exemplary painting services in the Bay Area for 45 years, transforming the interiors and exteriors of more than 22,000 residential and commercial buildings, including some of San Francisco’s most beautiful historic structures. Since 1974, De Martini/Arnott’s outstanding customer service combined with the highest professional standards have resulted in long term success based primarily on referrals. The company offers a full range of painting options, including faux finishes, lacquering, cabinet refinishing and specialty custom work. Every job includes a free professional color consultation. To help clients get exactly the look they want, paint selections can be brushed out in different color combinations to demonstrate how paint tones will look at different times of the day and under varying lighting conditions. Each interior and exterior project includes up to three colors at no additional cost. De Martini/Arnott uses only the highest quality paints and finishes and offers a 5-year guarantee on materials and labor. No-VOC and low-VOC paint choices are available. De Martini/Arnott is fully licensed, bonded and insured, and employs only professional painters with at least five years of painting experience (no subcontractors). Many of the company’s 35 employees have been with De Martini/Arnott for well over a decade. 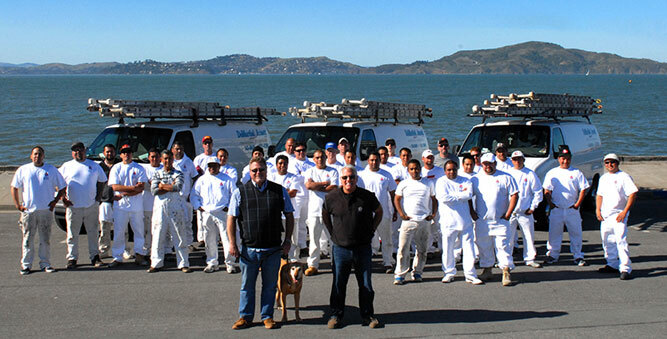 We are proud to be your go-to San Francisco painting company. We stand behind our work – all exterior painting jobs include a 5 year warranty.